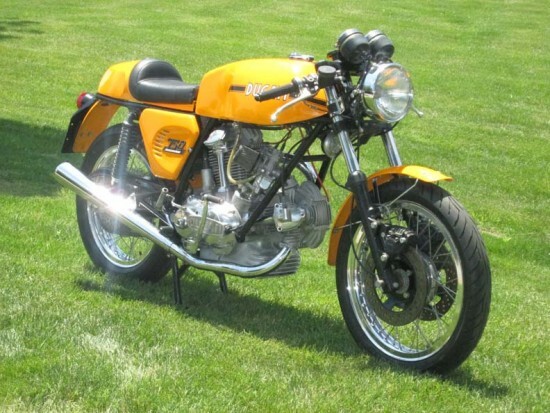 One of the best-looking bikes of this or any other period, the Ducati 750 Sport is one of those machines that looks fast, even standing still, the kind of bike that people will stop and stare at when they see one parked on the street, even if the next words out of their mouth are, “Ducati… Is that made by Harley? Very spare and very lean, the 750 Sport was the marginally faster, significantly less comfortable version of the 750GT. The tank was longer, and narrower for a sleeker profile, with a classic “bum-stop” seat along with racy clip-ons and rearsets. 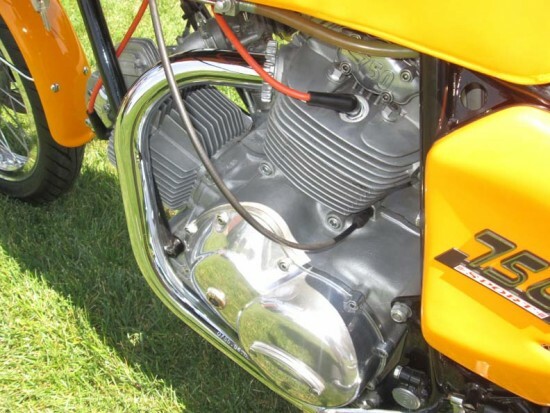 It included larger carburetors and high-performance engine internals you’d expect, although it did not use Desmodromic valves, something that was found only on the Super Sport models until the introduction of the Pantah engine in 1980. But from a visual standpoint, the Sport still has that classic, “round-case” bevel-drive style, with the pronounced tower-shaft housings and bevel-gear castings in the heads. 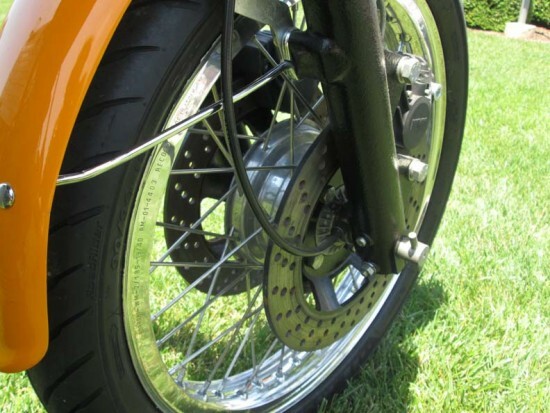 This example also features a dual-disc brake front end, which is a nice, period-appropriate upgrade to the much more common single unit. 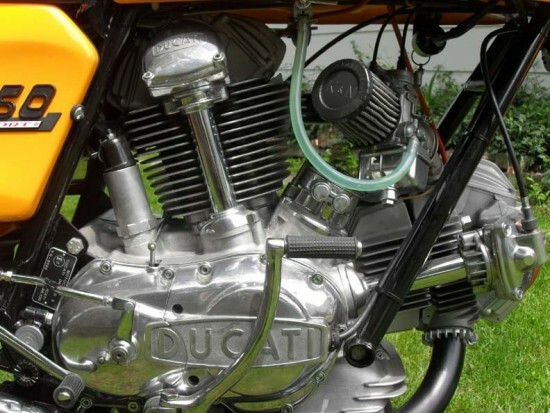 In typical Ducati form, “whatever’s on the shelf” seemed to apply to these bikes, with Lockheed, Scarab, and Brembo calipers being used depending on the bike, day of the week, and mood of the guy at the factory putting it together. 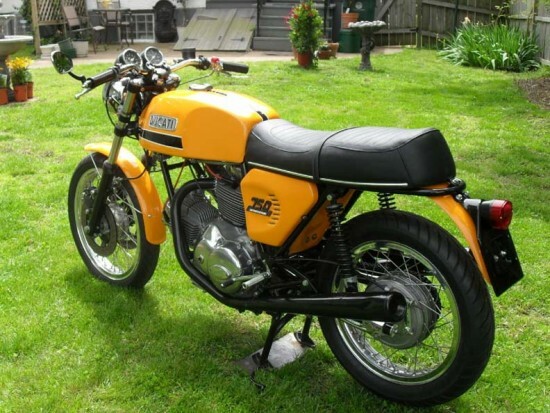 This bike was bought by it current owner in 1975 with 1,300 miles on it. The bike has some minor upgrades to its electricals and mechanicals. It also includes a GT seat, tank and bar adapter kit as pictured. Make no mistake, this looks like it is a very “Nice Bike.” But the short and to-the-point description does leave some unanswered questions. “10,000” miles are indicated in the listing, but the odometer clearly shows 30,000. And the bike has obviously received more than “minor upgrades” as the paint is different, the exhaust is different, the top triple and bars are different. So exactly what is the story with this bike? What kind of motorcycle do we have here? Is it really a Sport, or a dressed up GT? I’m guessing that this was originally a 750 Sport that the owner modified with higher controls and a more comfortable seat to make the bike more practical, along with a few other “aesthetic” changes like the blacked-out Contis. 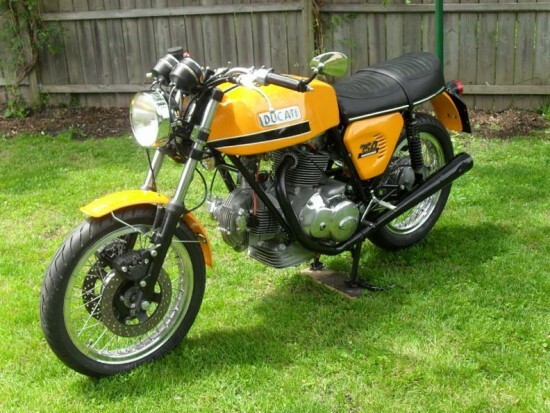 Then the bike was more recently put back into its original configuration, perhaps with an eye towards selling it. 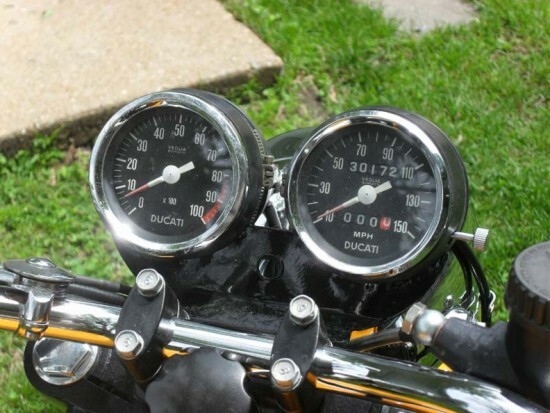 The odometer readings do seem to add up, assuming the seller hasn’t ridden the bike much since the restoration, and the photos in the original listing clearly display a VIN number and stampings on the engine cases. Any of our expert readers care to chime in on this one? 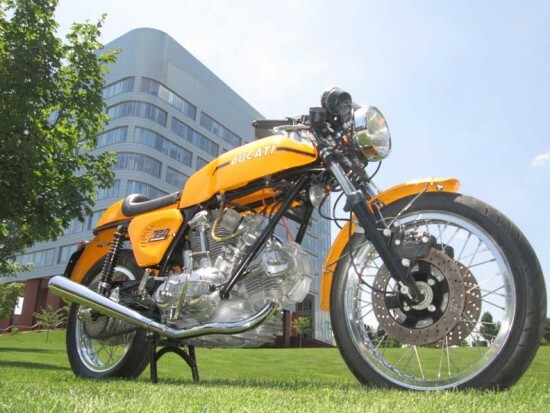 It’s obviously in beautiful shape, but is it one to ride, or one to collect? It is a bit distracting to see all the ‘dress-up’ on the bike, but it IS a Sport. Probably a Series 2 Production in ’74. The tell, given the not-to-detailed pics, is the seat loop of the frame. The GTs and the late-late Sports, used the “wide” frames while only the Sports used the “narrow” frames. The wide frames mounted the top of the shocks on center below the seat loop rail while the narrow frames mounted the shocks out-board of the rail as in this example. There were a bunch of other model specific frame differences too (like the orientation of the battery tray) that aren’t shown in these photos.